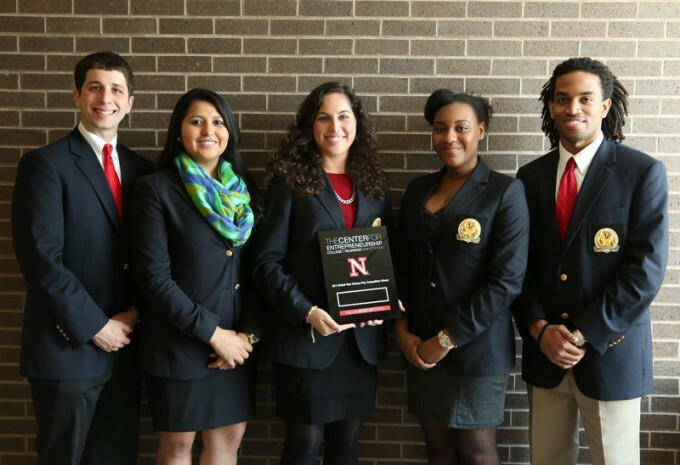 Bauer students (from left) Jonathan Cohen-Kurzrock, Brenda Rojo, Noy Shemer, Rowbin Hickman and Jonathan Brown from the college’s Wolff Center for Entrepreneurship won grand prize at the University of Nebraska-Lincoln New Venture Competition. EDITOR’S NOTE: This is the second in a series of stories highlighting the success of student business plan teams from the Bauer College’s Wolff Center for Entrepreneurship in Spring 2014. Each year, WCE students work with the university’s Division of Research to develop commercialization plans for technologies developed at the university. Over the past 12 years, Bauer teams have had 21 podium finishes in national business plan competitions. A student team from the Wolff Center for Entrepreneurship at the C. T. Bauer College of Business at the University of Houston won one of the oldest business plan competitions in the nation by building a plan around technology that makes renewable electricity reliable. Competitors Jonathan Brown, Jonathan Cohen-Kurzrock, Rowbin Hickman, Brenda Rojo and Noy Shemer placed first on March 20 at the University of Nebraska-Lincoln New Venture Competition with their business plan for Energetik, a technology pioneered by UH Cullen College of Engineering Assistant Professor Yan Yao that replaces the anode of a battery with 100 percent organic materials, resulting in a longer-lasting solution. The student team had just three months to prepare for the UNL competition after determining that a first technology was not market viable and selecting to work with Yao. Shemer also credits the team’s success to the support system at Bauer College and the Wolff Center.